According to the Associated Press, the country’s two main cinema chains said the movie has been postponed indefinitely, but no reason was given. Film Censorship Board chairman Abdul Halim Abdul Hamid said he had no idea why the film was shelved, given that it was approved by the board after a minor gay scene was cut from the film. Scenes “promoting sexuality were forbidden,” he said. The film was given a P13 rating, he said, which requires parental guidance for children under 13 years of age. “We have approved it but there is a minor cut involving a gay moment. It is only one short scene but it is inappropriate because many children will be watching this movie,” Abdul Halim told the Associated Press. He added that there was no appeal from Disney about the decision to ax the gay scene. Earlier this month, director Bill Condon told Attitude Magazine that the movie would feature an “exclusively gay moment” involving Josh Gad’s character, LeFou, the buddy of vain villain Gaston (Luke Evans). In Russia, the film received an age restriction, meaning people under the age of 16 will not be able to go see the movie in theaters without being accompanied by an adult. “Beauty and the Beast” stars Emma Watson and Dan Stevens, and will hit theaters Friday. Nov. 22 marks the 25th anniversary of 1991's "Beauty and the Beast," so TheWrap teamed up with IMDb to give you these 20 facts you may not have known about the Oscar-winning film. Belle (played by Paige O'Hara), the "beauty" in the tale, was the first brown-haired Disney princess. The smoke during the transformation of the Beast is not animated -- it was real smoke originally used in 1985's "The Black Cauldron," TheWrap confirmed. Although Angela Lansbury is famous for singing the "Beauty and the Beast" ballad, she originally thought another actor would be more suited. The director asked her to make at least one recording of her singing the song, which ended up in the film. Before "Up," "Beauty and the Beast" was the only animated film that was nominated for the Academy Award for Best Picture in 1992. While Belle sits at the fountain during the first song and flips though the book, you can see a dark-haired maiden, a monstrous male figure and a regal castle. Julie Andrews was considered for the role of Mrs. Potts before Angela Lansbury was cast. Lansbury recorded her lines during her breaks on the set of "Murder, She Wrote." When the writers wrote the part of Cogsworth, they had John Cleese specifically in mind, but he turned down the role (it then went to David Ogden Stiers). This was the first Disney animated film to have a final and fully-developed script before animators started their work on it. Laurence Fishburne, Val Kilmer and Mandy Patinkin were considered for the role of the Beast, which was eventually played by Robby Benson. Every line of the title song has exactly five syllables. The dance between Belle and the Prince in the finale is reused animation from "Sleeping Beauty" (1959), where Princess Aurora and Prince Phillip dance in the ballroom. The sign post that Belle's father, Maurice, walks by in the woods reads "Valencia, Anaheim and Burbank." Belle is the only one in her town who wears blue, meaning to show how different she is from everyone else. 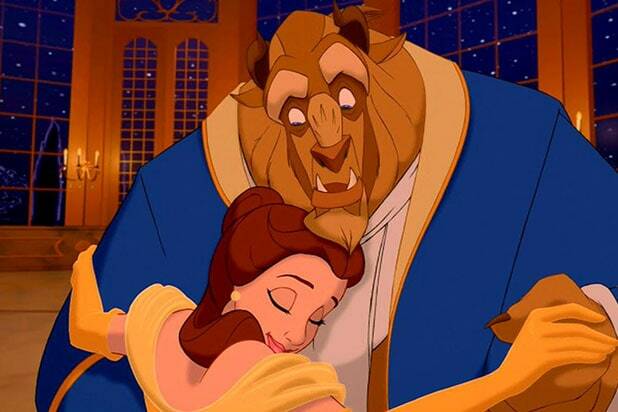 "Beauty and the Beast" was the first Disney animated film to cross the $100 million box office mark. The finished product consisted of 7,000 feet of hand-drawn film, 1,100 painted backgrounds and 150,000 individually-rendered frames. 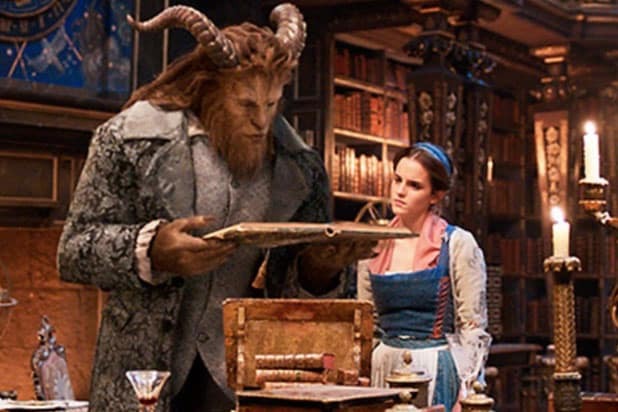 "Beauty and the Beast" took over three-and-a-half years to complete. Walt Disney considered making "Beauty and the Beast" four decades prior, but it was sidelined because they couldn't figure out how to deal with the story's "claustrophobic" second half. Glen Keane was the supervising animator in charge of designing the Beast. The creature became a hybrid with the mane of a lion, the beard and head structure of a buffalo, the tusks and nose of a wild bear, the heavily muscled brow of a gorilla, the legs and tail of a wolf and the big body of a bear. According to director Gary Trousdale, "Be Our Guest" was supposed to have been sung by Maurice. They then decided it would be more meaningful if directed at Belle. You can find more trivia, goofs and quotes on IMDb.